Large Chicago protest condemns Israeli massacres | Fight Back! 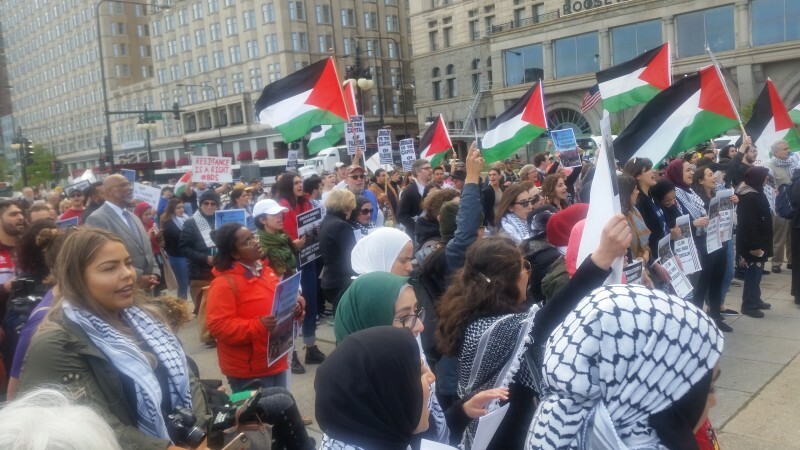 Chicago, IL – More than 1000 people rallied and marched in Chicago, May 15, in an emergency response to Israel’s brutality, and a rejection of the Trump administration’s dangerous and illegal U.S. embassy move to Jerusalem. The protest also coincided with the commemoration of 70 years of Nakba, what Palestinians call “The Catastrophe,” which marks the ethnic cleansing of almost 800,000 Palestinians upon the establishment of Israel in 1948. “The Trump administration’s decision to move the embassy to Jerusalem is directly responsible for the massacres we’ve seen today,” said Hatem Abudayyeh of the U.S. Palestinian Community Network. “The message to the Israelis from Trump is clear: you may continue to massacre Palestinians with impunity, and the U.S. is behind you 100%."